Gabe and his Parker six string, during FPB's gig on July 13, 2011 in Chittenango, NY. Tom and Fritz "ham it up" for the camera on July 13th during FPB's gig. As FPB Fan Club Members, Pam and Don LaMunion look on, Frank jams on bass during FPB's gig on July 13, 2011 in Chittenango, NY. Frank and Fritz are pictured here during FPB's gig on July 12, 2011 in New York Mills, NY. Mike gets a bit animated during FPB's gig on July 12th in New York Mills, NY. Gabe is pictured here during FPB's gig at Pulaski Park in New York Mills, NY on July 12, 2011. Fritz has a toast of Jager punch with FPB Fan Club Member, Charlie Miller during the FPB Fan Club Summer Picnic Party in Verona, NY on the afternoon of July 10th. FPB tearing through a tune during their July 10th afternoon gig in Verona, NY. FPB cranks out a tune during the FPB Fan Club Summer Picnic Party in Verona, NY during the afternoon of July 10, 2011. Tom is pictured here in Utica, NY on July 10th during FPB's morning gig at the Utica Boilermaker. Gabe, Mike, Tom, and Fritz are shown here prior to FPB playing at the Utica Boilermaker early in the morning of July 10th. 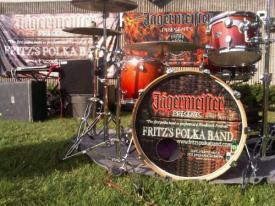 Mike's drumkit as set up in front of the two Jager/FPB banners for FPB's gig on July 10th in Utica, NY. Fritz's Polka Band is shown here in Oneida, NY on July 9th. Frank is "havin' fun" on Mike's drumkit during FPB's gig in Oneida, NY on July 9, 2011. Gabe is pictured here during FPB's gig in Oneida, NY on July 9th.